Day One of Cannes Pride – the AdParlor Top 100 digital leaders at the Cannes Lions annual advertising awards, got off to a bang with some heavy hitters dominating at the top of the leaderboard. Amir Kassael who is chief creative officer for DDB worldwide (and participating entirely digitally) took the top spot. In runners up we had Miguel Ruiz from Ogilvy Mexico, Jonathan Mildenhall from Coke, John Maeda from RISD (Rhode Island School of Design), and Hector Fernandez who is also from Mexico, Publicis this time. PeerIndex score of 55, 13 tweets that were retweeted 63 times and 84 conversations about Cannes Lions. 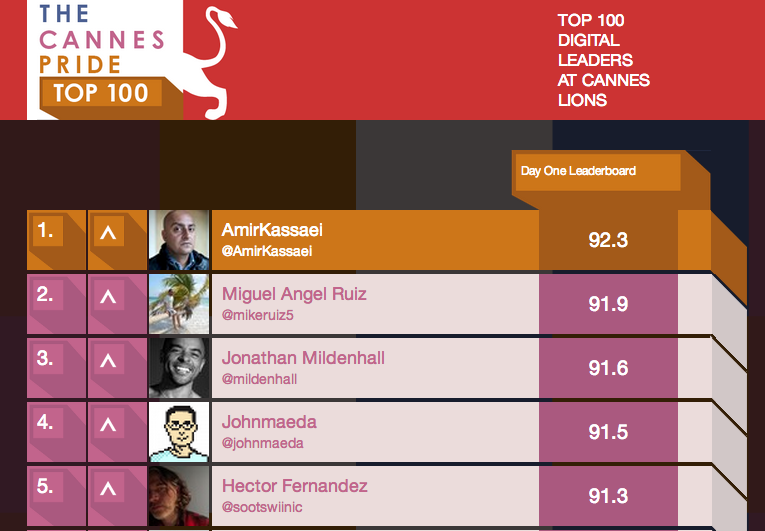 There are actually 10,000 people on the leaderboard so if you’ve tweeted on the #CannesLions hashtag you can go and find your position. Head over to https://www.leaderboarded.com/player/signin/1955 and sign in with your Twitter account to review your rank and see your own stats. Every Day is a new leaderboard so you’ve always got a chance to get to the top – Amir got there with just 13 tweets – it’s not about quantity its about quality, relevance and reach! If you’ve got a company Twitter account you won’t be able to play – we’re manually excluding all the companies who enter – this means we can cut through the noise to see the signal – who are the real individual digital leaders at Cannes.